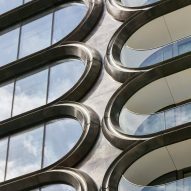 Zaha Hadid Architects has officially completed its first project in New York City: a residential building with steel bands and rounded glass corners beside the High Line park. Named after its address in Chelsea, 520 West 28th Street is an 11-storey structure that includes 39 private residences and a number of luxury amenities. 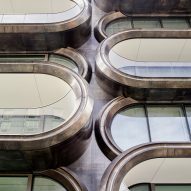 The building is wrapped in metallic ridges that join sinuously across the facade, and jut out from the floor plates to form balconies and terraces with rounded edges. Large floor-to-ceiling windows curve around the corners of the apartments, mirroring glass balustrades. 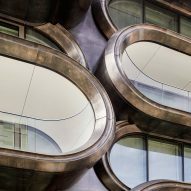 "The facade conveys the attention to detail evident throughout 520 West 28th – brushed and tinted by hand to resonate with the adjacent structures of the High Line," said Zaha Hadid Architects (ZHA) in a statement, which also described the building as "very much [part] of its surroundings". The main entrance space at one end of the L-shaped building is 1.5 storeys high, creating a split-level plan across the development that is articulated prominently on the exterior. 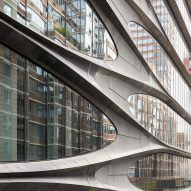 "These split levels are expressed within the interlocking chevrons of 520 West 28th's hand-crafted steel facade, which carries the spirit of Chelsea's industrial past," said ZHA. Adjacent to the High Line – an elevated pedestrian parkway along a former freight rail track – 520 West 28th Street is extremely visible in the otherwise dense neighbourhood. "There is a powerful urban dynamic between the streets of New York and the High Line, a layered civic realm that has developed over generations and in many iterations," the firm said. Passersby can easily peer into the apartments and private courtyard, formed from two walls of the building and a tall planted wall. The outdoor area is populated with tables and chairs and a stepped design that serves as a water fountain. The feature incorporates a glass panel that acts like a skylight for the private swimming pool directly underneath. The 25-yard (23-metre) subterranean lap pool is one of several amenities available to residents, along with an IMAX theatre and a gym – all of which were revealed in photos released in October 2017. These and other interior spaces share a futuristic appearance. An entryway has a grey wall with a texture that looks rather extraterrestrial, while planting provides accents for the otherwise monochromatic palette. Ornate ceilings are brightly painted white with detailed ridges. Built-in track lighting resembles a thin line of glowing rope. The structure's 39 condos range in price from $4.95 million (£4 million) to $50 million (£40.3 million) for a penthouse. Spanning three levels, the most expensive residence boasts a lacquered white internal staircase, and five bedrooms, a balcony on its lower level and large private rooftop. 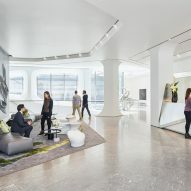 The building is designed with multiple cores, providing several private elevator lobbies with 11-foot coffered ceilings and tailor-made counters. 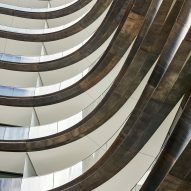 In the apartments, the kitchens feature white lacquered islands that ZHA designed with Italian brand Boffi, which mirror the flowing lines seen throughout the building. Other details include Gaggenau Hausgeräte kitchen appliances and bathrooms with electrochromic glass that frosts over for added privacy at the push of a button. A subterranean garage completes the structure and has an automated valet parking and storage network. A robotic system parks and retrieves resident's cars on call. 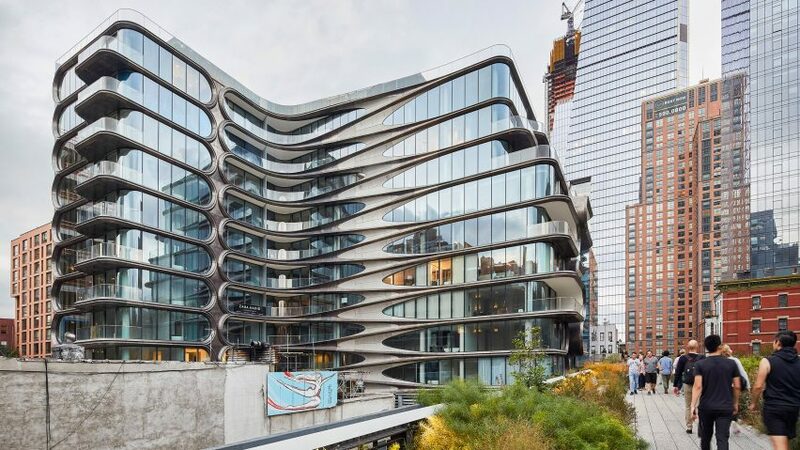 520 West 28th Street was designed by Hadid in collaboration with long-standing business partner Patrik Schumacher, who took over as director of ZHA after its founder's death in 2016. Developed by Related Companies, it is the architecture firm's first completed project in New York City. ZHA ranked at number 7 in the 2017 Dezeen Hot List of the world's most newsworthy forces in design. Many well-known architects and designers have projects in the surrounding area, which has seen a boom in construction since the High Line opened in 2009. Further south, BIG's pair of twisting towers are under construction and Thomas Heatherwick has proposed condo buildings with bulging orb-like windows.